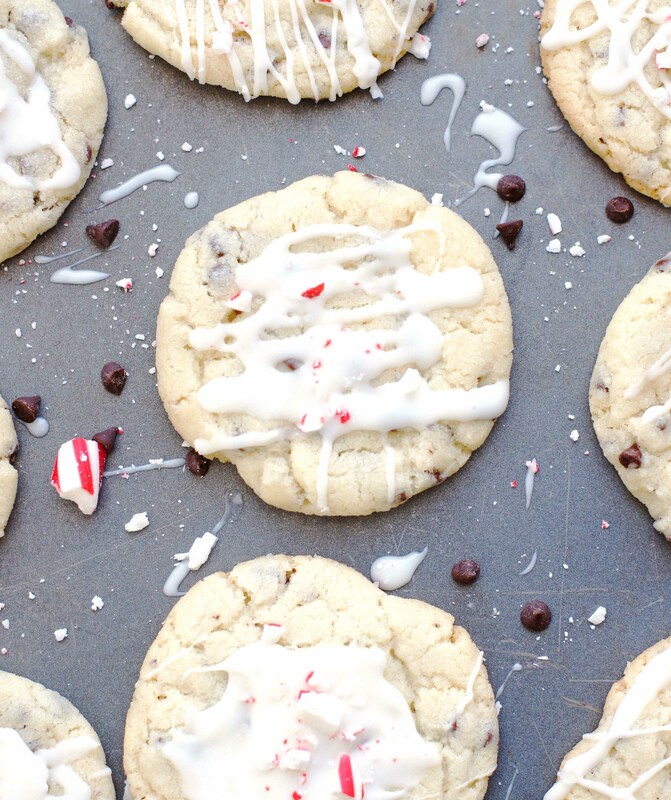 Peppermint Chocolate Chip Cookies are the perfect cookie for the holidays. 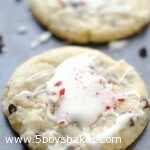 A minty chocolate chip cookies drizzled with a glaze and topped of with crushed peppermint candies. It’s December 1st (eek!) which means my 12 Days of Sugar has officially begun. I feel like I blinked and November was over. Does anybody else feel that way?I can’t even believe it’s time again for this sugar madness, but ready or not, it’s here so let’s roll! Get out your fat pants and/or running shoes my friends because there are a lot of delicious calories coming your way! I couldn’t think of a better way to start off this crazy sugar rush than with cookies? 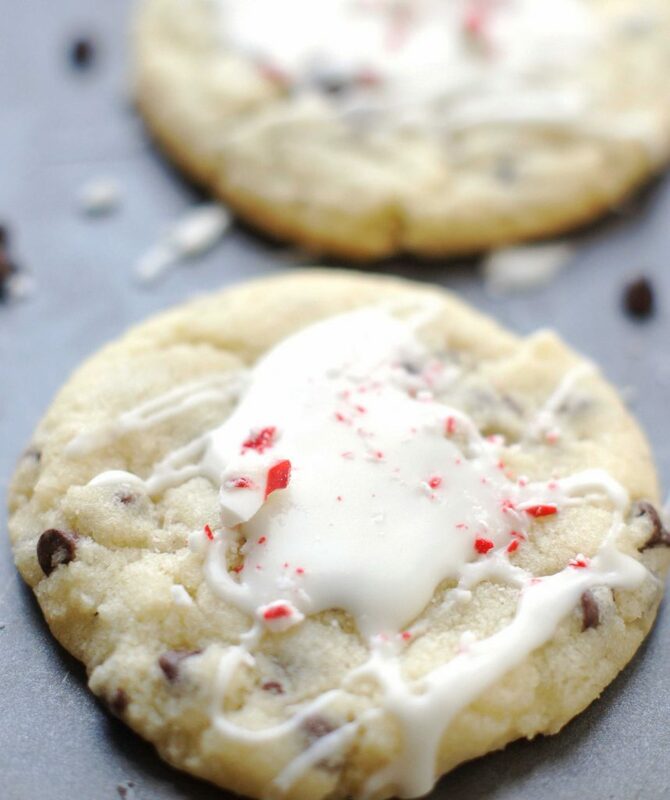 We all know I am a cookie fanatic and these Peppermint Chocolate Chip Cookies are the perfect holiday cookies. I tend to go a little peppermint crazy during the holidays. It’s kind of like in the fall when I make any and all things pumpkin. I kind of do the same thing with peppermint once Thanksgiving is over, so bear with me because you may be seeing a plethora of peppermint. These cookies are so festive and absolutely perfect for the holidays! Add the flour, baking powder, and salt, mix on low until combined. Stir in chocolate chips. Roll dough into 1½-inch balls and place, 2 inches apart, on your parchment-lined baking sheets. Bake the cookies for about 12 to 14 minutes, or until the edges of the cookies just barely begin to turn a light golden, rotating your baking sheets halfway through. Let cool on sheets for about 2-3 minutes, then transfer cookies to racks and let cool completely. Using a small bowl, whisk together the confectioners' sugar and 2 to 3 tablespoons of the heavy cream, adding more if needed to get the desired consistency. Drizzle or spoon the top of each cookie with the glaze, and sprinkle with the crushed peppermint candies. Let dry completely on racks and enjoy! Loved these cookies! And I loved the dough! Good mixture of chocolate and peppermint and they look pretty! And I almost went with regular chocolate chips, but the mini’s were perfect! Thank Christine! I loved the minis in them, but I think next time I would add a few more :)!